Hey folks, This is Le Jestre here. Today i am going to discuss about Nubatama. The clan that have been MIA since BT01. So where did those ninjas disappear to? Bushiroad sure have something up under their sleeves that they don't wanna disclose yet. Lets 1st answer the burning questions that everyone been asking. Lets 1st make an analysis of what support this clan will be receiving in the upcoming bt13. Opinions about this card: Isn't this better than the dragonic lawkeeper. CB1 to bind all their rearguards during their turn and gaining additional 10k power is just slightly broken for a single counterblast. So how to avoid him screwing your vanguard? It is to not give him enough targets to bind 3 cards into the bind zone. How is this card effective in the meta? This card is effective against decks that are reliant on their rearguard and field presence. Decks like Gold Paladin, Link Jokers, Celestials, Aqua Force. What are the other support that can be played with this card? [AUTO]: When this unit is placed on (VC) or (RC), if you have a «Nubatama» vanguard, choose up to one of your opponent's rear-guards, bind it face up, and at the end of that turn, your opponent puts that card into his or her hand. 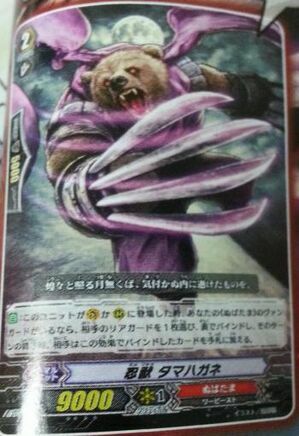 [ACT](RC):[Counter Blast (1) & Put this unit into your soul] If you have a «Nubatama» vanguard, and if the number of cards in your opponent's hand is three or more, you may pay the cost. If you do, choose a card at random from your opponent's hand, bind it face down, and at the end of that turn, your opponent puts that card into his or her hand. 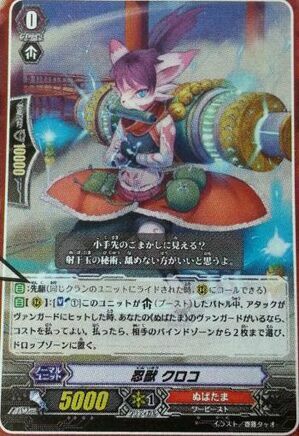 [AUTO](RC):[Counter Blast (1)] When an attack hits during the battle that this unit boosted a «Nubatama», if the number of cards in your hand is less than your opponent's, you may pay the cost. If you do, your opponent chooses a card from his or her hand, and discards it. 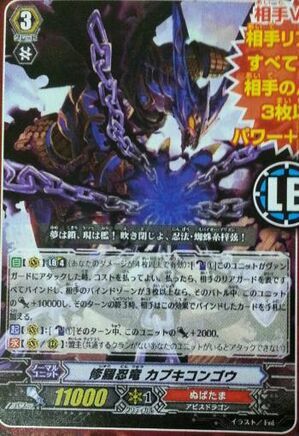 [AUTO]: Forerunner (When a unit of the same clan rides this unit, you may call this unit to (RC)) [AUTO](RC):[Soul Blast (1)] When an attack hits a vanguard during the battle that this unit boosted, if you have a «Nubatama» vanguard, you may pay the cost. If you do, choose up to two cards in your opponent's bind zone, and put them into the drop zone. 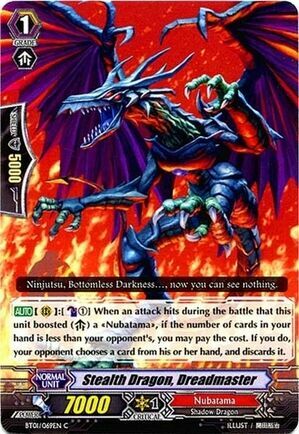 So what are the different type of combos a nubatama deck would pull off? Not to forget the pressure that the booster adds to the vanguard where if ya were to let the attack hit. Which Effectively -2 your opponent. Lets count now count how much your opponent will minus. Now wait... What if ya kanzen get binded? Oh fark!!!! = 10 cards if he guard with 5k shields. This obviously tells ya on how to play this card and play against it. Nuff said Just Kanzen!!! Now lets look at the combos the rearguard can pull. 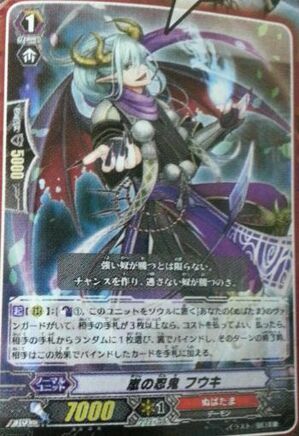 So what it does is that Fuuki will bind 1 card in your hand which is equivalent a minus 1 for your opponent during the guard step and a breakeven for yourself when she moves to the soul to give fodder to spam Kuroko's effect. So how to prevent this from happening, Burn Fuuki as soon as she appear on the field as allowing her on the field will become a threat when they broke ride on that turn. Which works similarly like a dust tail unicorn. What it does is that it pressure your opponent rearguard or vanguard with the attack. 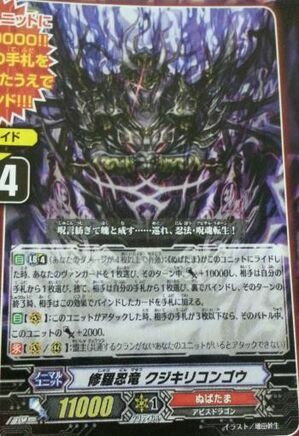 Therefore it is recommended to attack with this card after the vanguard to gain some buffs from the trigger. Coz a rearguard taking a hit from this guy is practically a minus 2 cards which hits you at a magic number of 16k where assuming ya rearguard is decent 9k and your vanguard is a 11k. Its either ya minus one to guard for your rear or minus two to let your rearguard die and chooses a card to minus from your hand. This can be good and bad. As sometimes ya might wanna let this card hit if you do not have enough shields in your hand to guard which allow you to discards dead cards in your hand like grade 3s.